As we all know real estate appraisals are huge in the housing market, but many things that make a home energy efficient can not actually be seen which makes it hard to compare homes apples to apples. We may see this change in the near future. The Appraisal Institute and RESNET are now working on getting certification levels posted in real estate documents. This is big! Read more about what this entails in the Press Release Here. Ancient buildings with clay can be visited all over the world, the oldest date back to 10,000 BC. Other materials haven’t boasted such a life span.” But in today’s construction industry, bio-based insulation materials are relatively niche. This is due to higher costs and because builders are yet to be fully convinced that alternative ingredients – plant waste, straw, clay, grasses and the like – are reliable, and the way forward. “Of course, modern times need more guarantees than just experience,” commented Lemke. But there are pros and cons. See the full article here. If it can’t be solid wood, what’s the next best building material? Here’s an article that discusses how clay-based building systems provide longevity, reduce the total embodied energy of a new home, and provide all of the benefits of thermal mass. Like solid wood walls, the article notes that clay-based materials improve indoor climate while being easy to maintain and repair. Sound familiar? Learn more about this here or from this pdf. Builders today are under tremendous pressure. They have to build the tightest, most insulated buildings of all time that are structurally sound; free of defects, fire hazards, mold, and moisture problems; AND are both cheaper and faster to construct than ever before. We can only accomplish all this if we gain more control of the building science and construction processes than ever before. It is the new reality of the construction business. To succeed in the 21st century, construction businesses will need to engineer building designs and construction processes to tighter and tighter tolerances. While codes have certainly been a catalyst for tighter homes, the compelling benefits of reduced leakage are driving the trend toward homes significantly tighter than code. I believe tighter building performance tolerances are becoming the new reality for the industry in part because of improving quality and measurement approaches. I recently came across an article that brought me upon NexusHaus. The article focused on the water-saving element of their submission to the DOE Solar Decathlon. They came in 4th overall, but I found the solution for water efficiency in an arid region exceptional. Not all areas of our country need to collect water in this manner, but integrating some of the project goals and processes into any home can help save the owner money. Less volume through a septic system will lengthen the life of that system. Not drawing fresh water for landscaping will save water resources as well as the energy to run pumps. Their solution brings the horizon of water conservation closer to home. 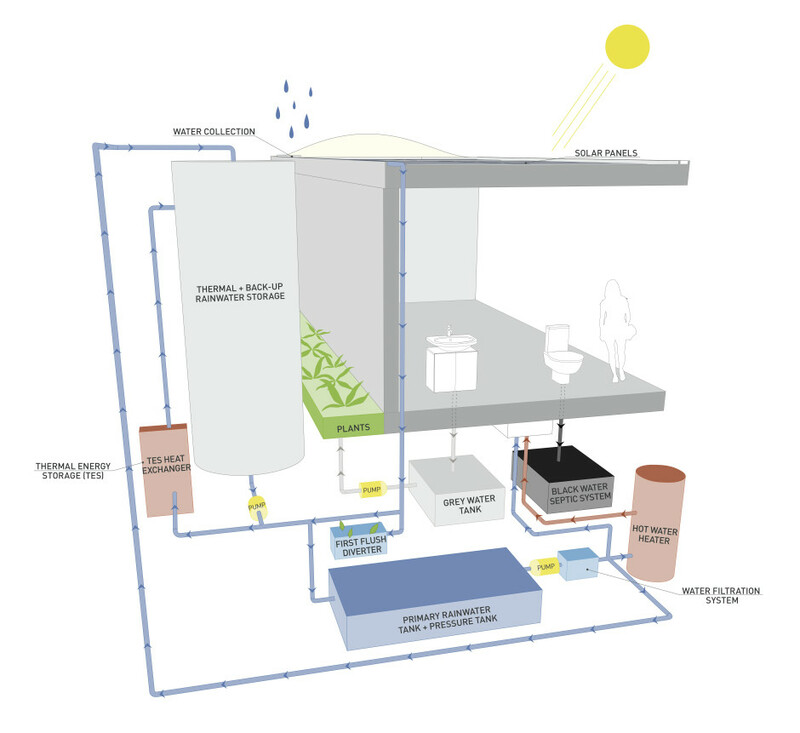 Take a look at the diagram below to see the system they developed specifically for the climate of Austin, Texas. Click here to see more from NexusHaus. Cross-laminated timber products (CLT) is another wood technology that originated in Europe and is changing how North America builds. This page will present news and information relating to CLT, a cousin to log building.